Sigma has really out done themselves with the F80 Flat top kabuki brush, it is one of the best make-up brushes out there right now! I want to congratulate and thank Sigma Makeup for creating this brush! It's my most fav Sigma brush right now. 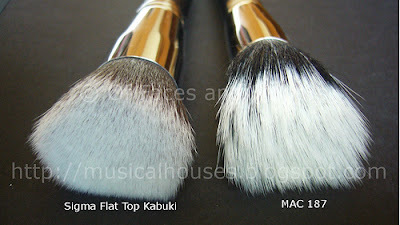 This brush,being a kabuki,is perfect for foundation -liquid or mineral. And it's knocked out every other brush I used for my cake/liquid foundation. It's beyond comparison! I find this brush so multi-purpose . It works perfectly with liquid, cream, powder or mineral foundation and it is amazing for bronzer too .It makes contouring look natural and it blends and buffs any product into your skin so well that you don't need to worry about having 'cakey' or 'thick' foundation. For me this definitely kicks all my other foundation brushes . The reason I feel it works so well is the density of the brush, the bristles are packed in there tight but it still gives the right amount of movement to make make-up application so easy giving a flawless soft finish. The fact that it's SO dense makes foundation application a piece of cake. You literally need no effort and time to cover your entire face and the outcome will be flawless. Also, being so dense,it will not absorb the foundation into the inner bristles,making it impossible to apply; the product is distributed evenly amongst the bristles,which means that it will be evenly distributed on the skin as well. Unlike a lot of other foundation brushes it won't absorb your foundation or liquid make-up into it, saving you from wasting or using excess product. Synthetic,as stated on the handle itself Sigma F80 is extremely soft. The first day I got the brush,I couldn't stop touching it,as the feeling of it against your skin as amazing ( remember my claim that its my LOVE AT FIRST TOUCH ) I haven't had any shedding problems with it,and I suppose that's because of the synthetic bristles. I didn’t found any cleaning problems either and it dries quickly in a hot weather like Pakistan. Small and cute! The handle is very thick,which makes it easy to handle and control. I must say it’s just look classy and elegant. What I do with the F80 is that I wet my Kryolan Cake Foundation ( with plain water spray) and apply dots on my face and then I stipple it all over my face. This thing is amazing! It covers a lot of area on my face at the same time, and this is why it works faster. After stippling, I lightly buff everything out by going in short circular motions all over my face. It's quick, it's easy, it's simple, and I NEVER knew what a true airbrushed finish looked like UNTIL I used this brush.. It blends it SO well, and the foundation just disappears into your skin making it your OWN. For a Liquid Foundation I use small circular motions and the result is absolutely flawless. The product blends in so well and effortlessly.You get the perfect airbrushed look in no time. What I like about this brush is that you can choose whether you want to stipple or buff; buff the product in circular motions,if you want a lighter coverage or stipple it using short strokes,if you want to achieve a higher coverage. And something else very important! I have large pores (due to my oily skin) and somehow the way this brush applies foundation makes them almost invisible. I guess it's because it buffs perfectly,filling in any gaps. Perfect flawless airbrushed effect. The finish you get is amazing. The foundation blends extremely well into the skin. The result is even and perfect. I've used this with my Kryolan Cake Foundation(review here) and it works great with it . Very reasonably priced at US$ 16.00. And worth every single penny. You can order it online from Sigma Makeup. Get yours now! Overall,this is an amazing brush. I highly recommend it and I don't think I'll ever stop using it. Sigma did a great job with this one! If I could have only one foundation brush,this would be it. 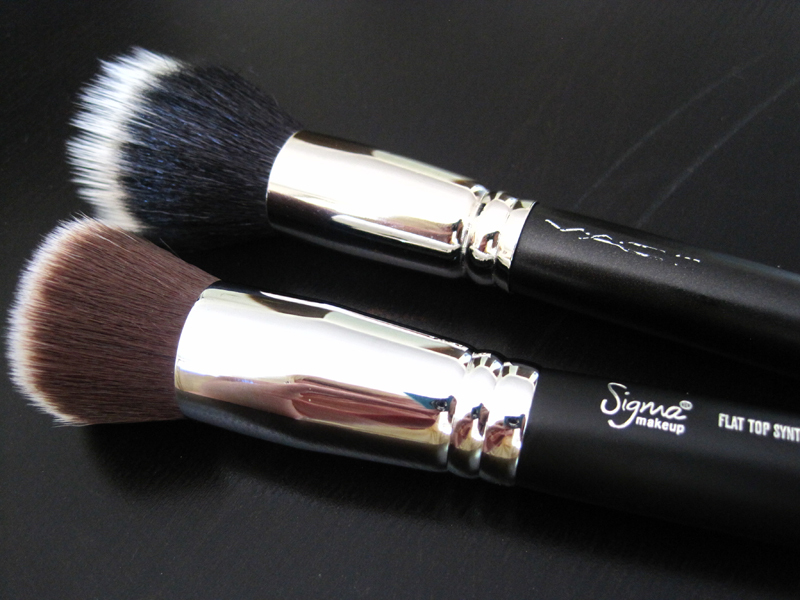 Have you tried the Sigma F80 brush? 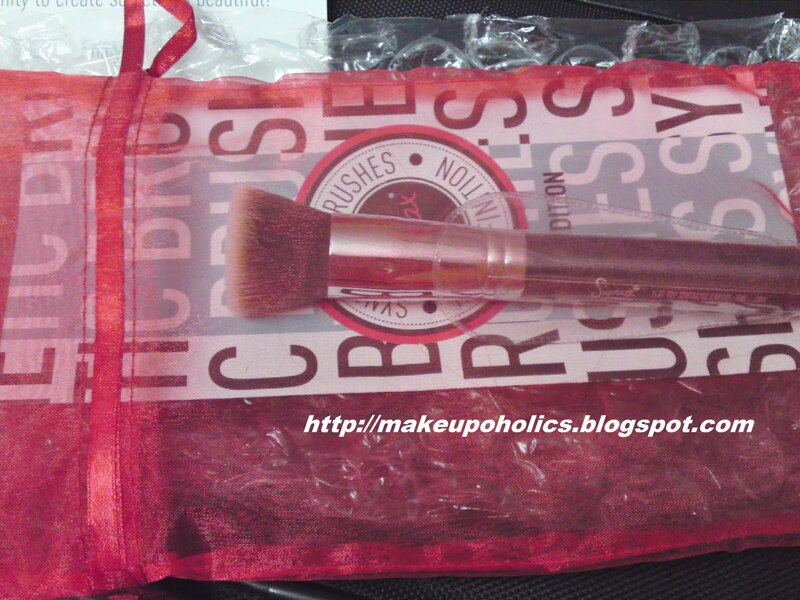 Love this brush :) Great review!